OK, this is awkward. 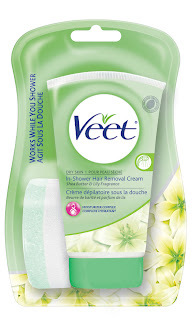 I'm standing naked in the bathroom with my legs covered in new Veet In-Shower Hair Removal Cream ($7.99). I have to wait one minute before entering the shower but no more than two minutes once I'm in there before washing it off. The bad news is, it smells like you'd think hair remover would smell (but it won't be as noticeable once you break open the aromatherapy shampoo). The good news is, I can condition my hair while I'm waiting. Of course, this requires a slightly difficult stance--trying to get my head under the water but keep my legs out of it so as not to wash the cream off too soon. Finally, it's time to come clean. I use the white textured side of the application sponge to wipe away the cream, which hopefully takes the hair along with it, then I rinse off any excess under the shower head. As I finish my cleansing routine, I have my doubts. I think about all the precautions listed on the outer package: Only use on legs, arms, underarms and bikini lines, don't use on irritated, sunburned or recently shaved skin, test for an allergic reaction beforehand, wipe cream off immediately if you feel any tingling, don't exceed six minutes of application time, among others. That's a lot to think about when all you want to do is take a nice, relaxing shower! But you can't be too cautious with these things. I towel dry and run my hands over my legs to experience the results. Smooth sailing! Overall, it was a pretty simple process and--luckily for those of us who just aren't always safe with a razor in hand--a fairly painless one. I can't wait to see how long it lasts. Get your own smooth at www.veet.us. You can drink it if you want to (in orange juice or grapefruit juice)...or eat it in your fruits and vegetables (try potatoes and strawberries). But to ensure you're getting your standard daily recommended intake of 200 to 300 milligrams, why not smooth it on your skin too? Vitamin C has long been touted for its benefits--providing energy, strengthening the performance of the heart and reducing the risk of some forms of cancer. But it also protects skin from free radicals, helps collagen production and helps repair the visual effects of sun damage. And the newly launched Vitamin C Serum from Mario Badescu Skin Care ($45)--composed of ascorbic acid (which reduces discoloration and brightens skin), hyaluronic acid (which retains skin's natural moisture) and collagen (which improves skin's firmness and elasticity)--delivers. Since we can all probably use a little toning up, I decided to give it a try. As instructed, I applied three to four drops on my face every other night after my cleansing routine. It was lightweight and absorbed easily. The immediate result: softer, smoother skin. But firming and toning are a bit harder to detect. I mean, if I ask my friends if they notice anything different about me, they surely won't say my skin looks tighter! Still, I continued to follow my regimen and noticed my skin definitely looked better--more even-toned and definitely healthier overall. I have to admit: I was a bit hesitant to try it at first, as my sometimes sensitive skin doesn't always react well to acidic products. But this formula feels soothing and calming--maybe because of the aloe vera, cucumber and lavender thrown into the mix. Use it alone or follow with moisturizer and things will start looking up--even when the economy is down. Buy yours at www.mariobadescu.com. 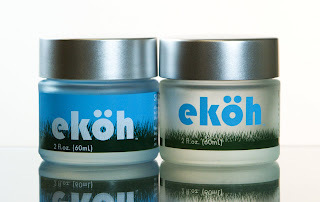 Some beauty products are all hype...Ekoh Cosmetics' Skin Retreat is the real thing. It just feels good when you smooth it on and even better when it sinks into your skin. Set to hit stores next month, this all-in-one 24-hour moisturizer is designed to calm, soothe and hydrate your skin. And it smells yummy--thanks to all the fruity ingredients (wild blueberry, raspberry, cranberry, cherry, strawberry, among others). What's not in the formula: sulphates, parabens, petrochemicals, polymers, synthetic fragrance and colorants--and there's no animal testing used to get the end result. The lightweight cream is the perfect way to end a day. Just apply to your face, neck and chest areas, then drift off to a peaceful sleep as it does its duty. Before smoothing on Skin Retreat: Try Ekoh's Pre-Party Prep Exfoliating Facial Scrub. Apply to skin, let sit for three minutes, scrub lightly, then splash off to give skin a healthy glow. For more info or to find out where to make your purchase, go to www.ekohcosmetics.com.